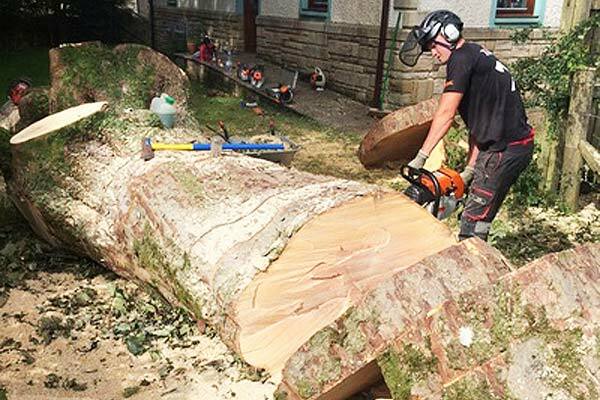 We are professional tree surgeons and as part of our service package we can remove tree stumps quickly and effectively and turn reclaim some of the space in your garden where it could be ready for re-turfing, re-landscaping and planting. Tree stumps are not only eyesores, but they can become hazard and damage garden equipment if you can`t see them properly when you are moving the lawn and they can also become a home for pests e.g. mice/rats and food for insects. If you want them to rot naturally then you may have to wait a long time and in the meantime diseases can set in which can spread e.g. honey fungus. 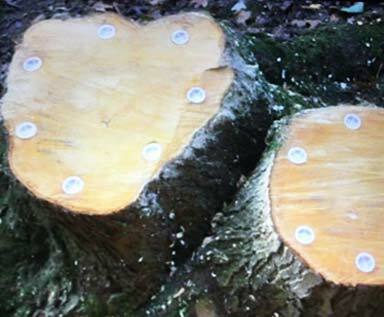 We use Ecoplug Max® stump killer which is a highly effective patented tree stump killer that basically stops new growth coming back from the base of the stump of the tree. 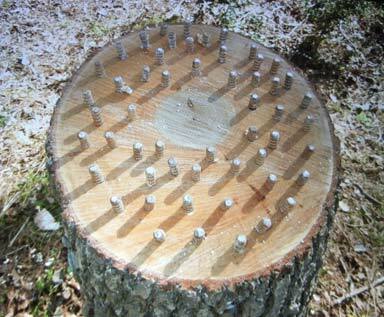 A plug with granular glyphosate herbicide is inserted into the stump to kill it and to stop any re growth, because once you cut down a tree sprouting there will be new growth happening almost immediately. 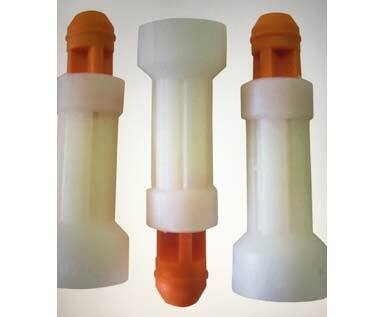 It can be used all year round, with minimal use of herbicides and no contamination to the water table. 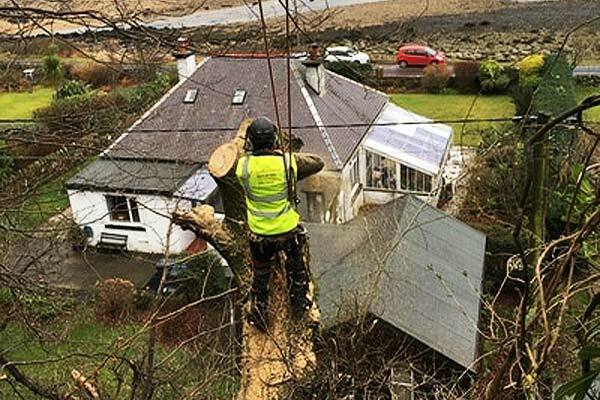 "Stevie and his crew did a grand job removing two trees and their stumps from my garden. Would have no hesitation in recommending Special Branch to my friends." Cameron coped very well under the pressure of an audience including grandparents and small children. And despite being very busy were able to accommodate a request to come at the weekend so the kids could see the tree come down, shape the stump into a seat and cut a couple of discs for our local nursery for resources for the kids!! Very hard working, polite, friendly and patient with my many and varied questions. I'm delighted with my new garden furniture and look forward to enjoying the garden with a cuppa from my new seat and side table. Overall it would be up to the tree surgeon to make an assessment of the state of the stump and what would be the best course of action. There is a safety aspect as they can become hazardous if people trip over them or damage gardening equipment especially if they are small and hidden. 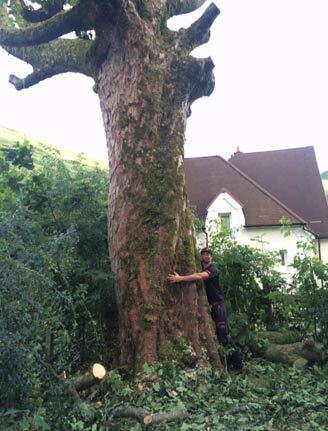 The roots can keep growing even after the tree has been felled and that can cause problems to the surrounding area and the tree can start growing again. It can be the perfect home for all sorts of pests e.g. Hornets, Wasps and Ants who love a decaying tree stump to set up shop. They don`t look great in a manicured lawn. Tree stumps should be removed after felling to stop pests, suckering and fungal root rots. You can rely on our team to get the job done right first time!